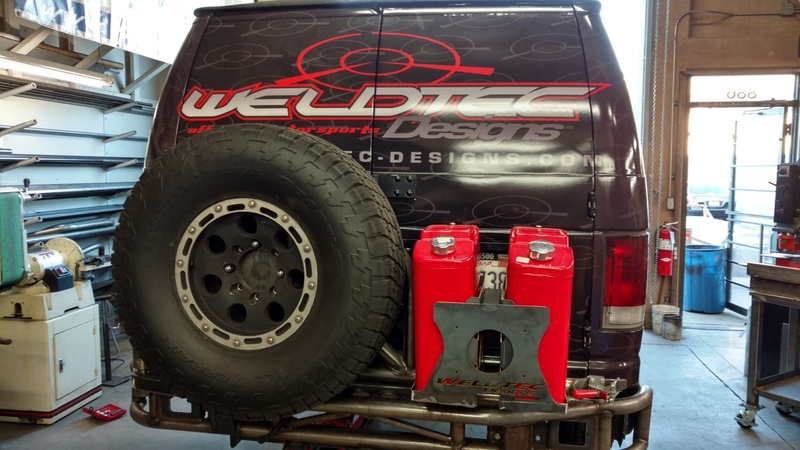 A little to what we have been working on as far as a new rear bumper with a tire carrier and now a gas rack. Trying to decide what is necessary and what can go inside here is what the build looks like so far. 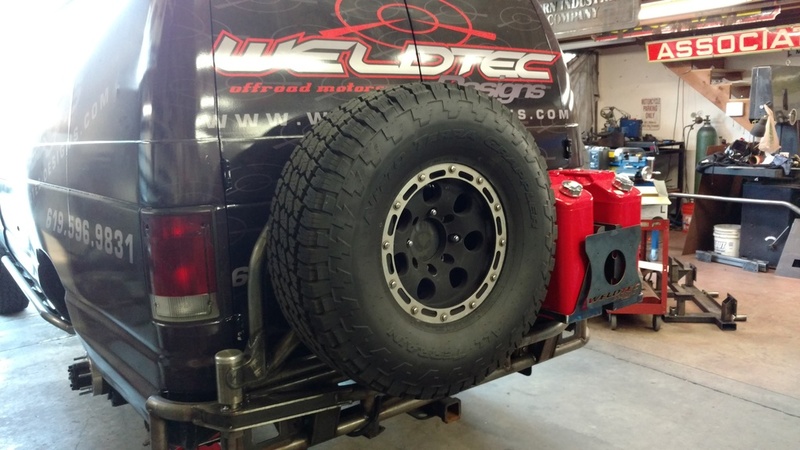 The 35" tire makes it necessary to overhang the main door without blocking the taillights. 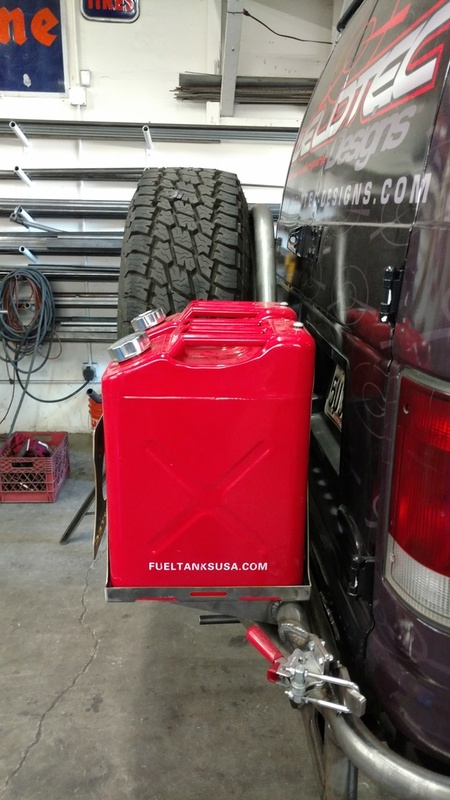 The Gas can rack also includes a bracket to relocate the license plate along with room for mounting a light. Trying to keep the overhang to a minimum. The large bearing and mounting bracket to support the weight. So my question is, why is the spare tire typically on the driver's side of bumpers? Is it to minimize the rear-view obstruction when using the windshield mounted mirror? If you were to move the spare to the passenger side, you would only have to open the passenger side swingarm to open the passenger side rear door, as opposed to both swingarms, and if you need roadside access to the spare, better to do it on the shoulder-side of the road, than the traffic-side of the road. X2 on passenger side. My old van had it on that side. The bottom of the tire was just above the bottom of the bumper. I saw this bumper in person. 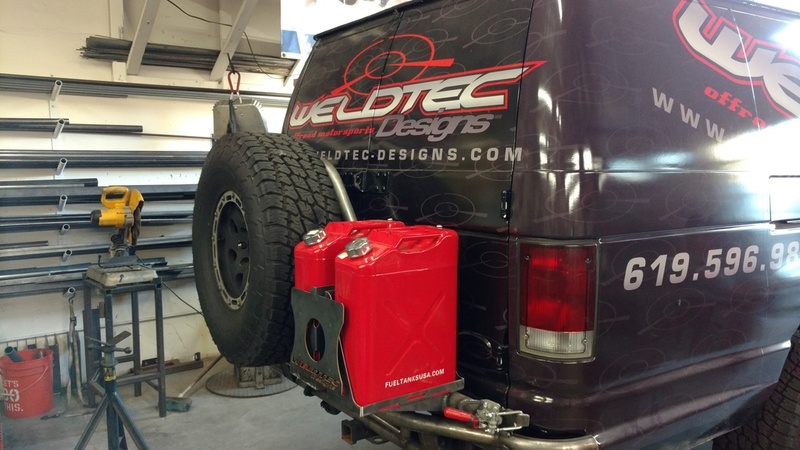 Solid work, I'll be getting this for my van when the time comes. For those talking about the passenger verse driver swing, my 2 cents is I prefer driver swing, the passenger side is more than likely where I'll set up camp, due to the access of the rear passenger barn doors. Less clutter to deal with while in camp. I saw you are doing custom boxes for Fleet projects, any thought on doing a box instead of can holder? I'm gonna run a 285/75/16 so I've got a little more space compared to the 35. Wouldn't mind some exterior storage that isn't on the roof. I was looking at it last weekend love it. You way want to consider a shock to the door hinge to minimize lateral vibration. I have a similar one of a kind custom and was getting too much vibration while off-road. Nothing that a $20 shock couldn't fix. Thanks for the compliments, we are trying to add cool and different products then otherwise available for these vans. There is only one swing arm not two, so if you swing it open 1/2 way you can still access the back door. If it mounted on the right you would not be able to do that. MY .02 cents. If you open your spare tire swing while on the roadside in traffic in order to remove your spare you may deserve to get hit by a car? But i hope you are all smarter then that! With a seatbelt??? Ultimate chase view???? I always thought it was typically on the driver's side so that you could easily get in the back of the van via the passenger side door which opens first? Anyway, with bigger tires it's inevitable to have to open the swingarm first which is more to deal with.